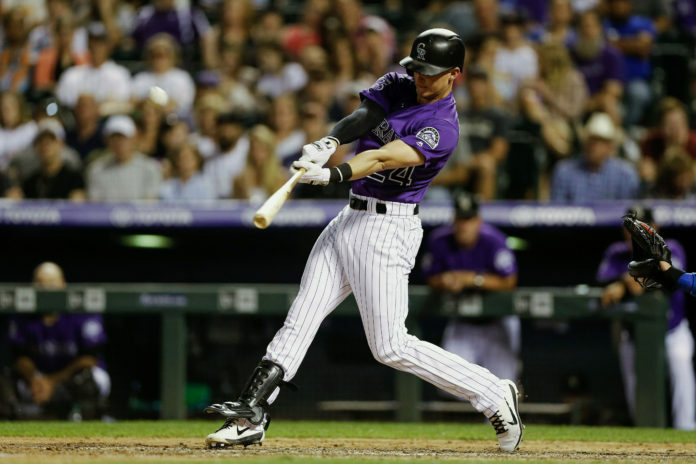 LoDo magic was reinvigorated over the weekend at Coors Field, and Colorado Rockies rookie utility man, Ryan McMahon was at the forefront of that resurrection. After another bullpen collapse in Thursday’s 8-5 loss to the Dodgers, the Rockies were searching for someone, anyone, to step up. Then came Friday night’s game-an outing in which starting pitcher John Gray struggled giving up four runs in just 5 2/3 innings. Rockies manager Bud Black was forced to call his bullpen into action, but in this case, they finally rose to the occasion. After three and a third shutout innings from a mix of Harrison Musgrave, Jake McGee, Scott Oberg, and Adam Ottavino, the bullpen was able to keep the Rockies in striking distance, where an unlikely hero would emerge. After a Carlos Gonzalez strikeout and DJ LeMahieu single, McMahon stepped to the plate with the Rockies down 4-3, and the rest of the story… well, its magic. McMahon’s two-run home run off left-handed reliever, Zac Rosscup gave the Rockies a 5-4 lead, which they held onto en rose of snapping a three-game losing streak. The home run has an even deeper story than what meets the eye. Rosscup, a former Rockies player, gave up a home run to McMahon earlier this season during a live batting practice session. Luckily for the Rockies, the second time they squared off ended a lot like it did just a couple months ago. The even crazier part of McMahon’s Friday night heroics was that he wasn’t supposed to even be in the game. 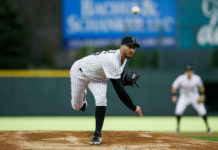 After a shoulder injury forced Nolan Arenado to be removed from the game in the fifth inning, McMahon filled in at third base not just on Friday night, but Saturday night as well. Friday night ended up being just the start of McMahon’s heroics as the best was still to come. With the Rockies down late on Saturday night, McMahon put the team on his back once again, and by doing so he put the Rockies right back in the race for a spot in the postseason. 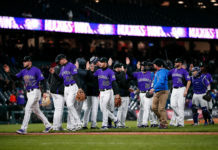 Even after playing hero for two straight nights, McMahon still wasn’t done as he played another huge part in the Rockies walk-off victory Sunday afternoon. After the bullpen blew another lead, McMahon stepped to the plate in the bottom of the ninth, tied ball game 3-3, but this time the Dodgers intentionally walked him. Probably a smart moving considering what transpired the two nights before, but nonetheless, McMahon’s walk set up a two out plate appearance for Chris Iannetta, who earned a walk of his own paving the way for a 4-3 victory for the Rockies. The common theme for the Rockies past weekend was bullpen issues and the rise of McMahon. After getting called up and called down at nauseam throughout the season, McMahon’s past weekend might be what helps him stick in the big leagues for good. After getting called up on July 29th, McMahon’s already made his impact felt with an average of .324 throughout the last 15 games. During that span, McMahon has also driven in seven, hit four doubles, and chipped in two huge home runs. McMahon’s versatility is one of the greatest things he brings the Rockies with his ability to not only play first base, but every poison along the infield and outfield as well. That versatility coupled with what happened this past weekend could lead to much more playing time for McMahon moving forward. 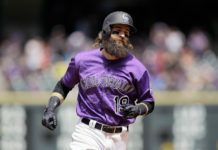 He’s certainly been no stranger to the limelight these past couple of days, and his heroics have placed the Rockies right in the thick of things within the NL West race. Going into Monday, the Rockies are now just two a half game back of the Dodgers, and just a game and a half behind the Arizona Diamondbacks for first place. Colorado has also played themselves back into position for a wild card spot as they trail the Philadelphia Phillis and Milwaukee Brewers by just two and a half games. If the Rockies are able to get right by their bullpen, than there’s now telling how far this team can go. If the Rockies continue to post on the of worst bullpen era’s in the MLB (5.16, 29th), and continue to blow saves (23, 29th), it’ll make a postseason berth a lot more difficult when the beginning of October rolls around. One thing the Rockies hadn’t been doing till this past weekend was making plays when it mattered most. A lot of it falls on the bullpens shoulders, but the Rockies also weren’t hitting well enough to put them in a position to get the job done. McMahon sparked the offensive side of this Rockies team, and now someone has to do it for that bullpen. If the Rockies are able to figure that part out of their game, there’s no telling how many more LODO magic games we could see this season.